Message to pastors in Tennessee: When Muslim men enter your churches, sit briefly during the service, then leave, they aren’t there to convert to Christianity. Neither are the Muslim men that sit in church parking lots observing the congregants as they leave. Nor are the Muslim men asking for tours of your churches. It is called surveillance. Stop embracing the enemy, and protect your flock. It started late last year in small rural churches in southern counties of Tennessee and Alabama. 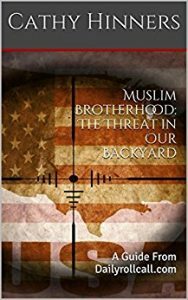 Now it is progressing to larger, suburban areas, where Muslim men appear for no reason, sometimes briefly introducing themselves then quietly slipping away. Allowing these visits is dangerous and all precautions should be taken. It seems a mentality of Muslims acting out their true “religion” in Europe is seen as “over there” and couldn’t possibly happen here in America. However, it only takes a glimpse into the Quran to see what all Muslims are prescribed to do. The following is just one of several pages in the Annoor Academy’s textbook widely used in Islamic schools across Tennessee. Titled “What Islam Is All About” by Yahiya Emerick, this clearly shows what Muslim children are being taught in their classrooms regarding Christians and Jews. This is just a small sample of what the Muslim “holy book” and textbooks reveal about Christians and Jews. The lesson to be taken away is while Muslims claim to be tolerant and accepting of other religions, their own doctrine tells them otherwise. Pastors have a duty to inform their congregations about Islam and to protect them from harm. “Islam is not in America to be like other religions, Islam is in America to be dominate above all other religions”. Wake up, Islam is not your friend. Next → Next post: “Indivisible” Paid Presence at Fairview Town Hall? For those of you out there, doubters, needing more info before your head is led to the Guillotine: http://www.breitbart.com/texas/2017/02/25/trump-supporters-in-texas-protest-against-civilizational-jihad/ Personally , I would prefer we just put a bounty on them, but then you would have some real smelly carcasses. Just lets get behind Trump and deport the goat herder Bastards back to their homeland.